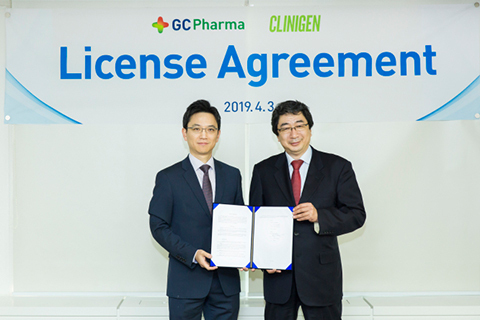 GC Pharma, a South Korean biopharmaceutical company, Thursday announced it has signed a deal to license its investigational Hunter syndrome drug to Clinigen KK, the Japanese unit of U.K. orphan drug firm Clinigen Group, which operates in 11 countries. Under the terms of the agreement, GC Pharma is eligible to receive an upfront payment and future milestone payments contingent upon achievement of commercial objectives, while Clinigen has exclusive rights to develop and commercialize Hunterase (idursulfase-beta) ICV in Japan. The two did not disclose financial terms. Hunter syndrome is a rare disease caused by a deficiency of iduronate-2-sulfatase, an enzyme required for the lysosomal degradation of heparan sulfate and dermatan sulfate. It leads to a range of disease-related signs and symptoms including skeletal abnormalities and intelligence impairment. It is estimated to affect one of every 100,000 to 150,000 boys. There are about 70 Hunter syndrome patients in Korea, 150 in Japan and more than 2,000 around the world, according to estimates. Because Hunterase itself cannot cross the blood-brain barrier, the intracerebroventricular (ICV) route of drug administration is used. The company expects it to be the first ICV therapy to treat the disease and overcome the limitation of exiting intravenous formulations due to BBB crossing inability. Clinical data of Hunterase ICV in Japan demonstrated a reduction in heparan sulfate, which is known to cause intelligence impairment. Clinigen plans to file for marketing approval of the drug in Japan within this year.